ALVA FOOD collects, processes and conditions animal and vegetable fats suitable for human consumption. Our core business is to remove water and impurities contained in fat, and stabilize and secure the finished product to make it compatible with consumer standards. 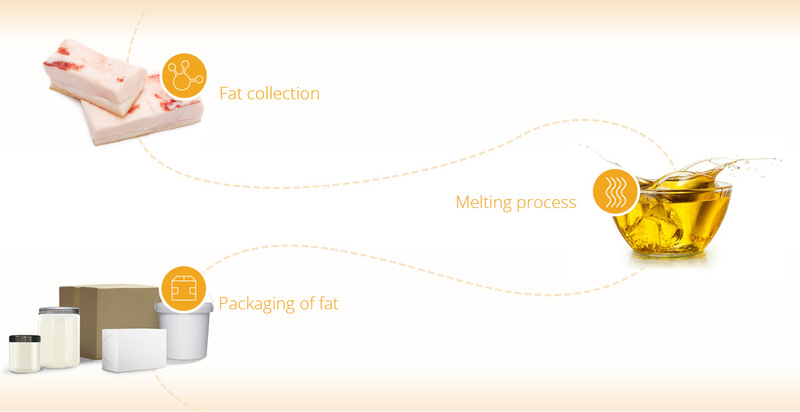 Our expertise allows us to process the most fragile fats while perfectly respecting their qualities. Integrated within the food industry, our business is one of its key components. ALVA FOOD listens to consumers and distributors to develop its ranges and design its packaging. We continually work with our customers to propose developments or areas for technical or nutritional improvement. We can provide packaging suitable for the food-processing industry, restaurateurs and distributors. Equipped with our own laboratory, we also work with organizations to develop specific mixtures such as vegetable/animal mixes or other specialities. We provide very reactive support in your market developments. We attach great importance to customer satisfaction: the sales team of three sales assistants and two sales people listens to you and assists you throughout the year.